black belt mastery for solving personal and professional challenges in today's complex world of change! We live in a rushing, fast-moving world. It's changing. It's chaotic. It's turbulent. It's easy to get swept up by these challenges and lose our sense of direction and purpose. Our personal lives can experience turbulence too. Teenagers struggle with school, body image, fitting in, and discovering their identity. Marriages can take a back seat, as careers take a front seat in our lives. Stress can make us irritated and tired — taking us away from quality family time. The list goes on. Mental self-defense: When someone attacks you with harsh comments — or is in disagreement with you — you'll know how to create a win/win solution and third alternatives. Stress management: You'll know the secret for dealing with stress — deadlines, pressing meetings, and handling multiple tasks — with greater ease. Overcoming daily pressures: In the face of conflict, you'll handle these with mental calmness. Win/win mentality: Instead of being threatened by the competence of others — you'll share knowledge, recognition, and profit. And by doing so, tap into more creativity, resourcefulness, ingenuity, wisdom, and intelligence. Plus so much more. Stephen was one of the few management authorities to have stood the test of time. He was co-founder/vice-chairman of the FranklinCovey Company, a leading global professional services firm. Stephen was best known as the author of The 7 Habits of Highly Effective People, a No. 1 bestseller by The New York Times. It has sold more than 15 million copies in 38 languages throughout the world. In 2002, Forbes named this book one of the top 10 most influential management books ever. And in 2011, Time listed it as one of “The 25 Most Influential Business Management Books”. Stephen went beyond The 7 Habits of Highly Effective People to reveal a new framework for solving problems in Nightingale-Conant's The 7 Habits Mastery Series. Today, turbulence reigns in what Stephen termed the "permanent whitewater world." We have political and economic upheaval. We also have an accelerated rate of change and uncertainty in the workforce. Martial arts are principle-centered. For instance, black belt principles include modesty, courtesy, integrity, self-control, perseverance, and an indomitable spirit. Stephen R. Covey's approach is also principle-centered, with an essential seriousness of purpose. He talks about terms like integrity, character, and responsibility. Plus, he not only means what he says — he walked the talk. He was a true leader... a black belt in life. Stephen said, "I'm convinced that [these habits] are increasingly relevant in today's turbulent, troubled, complex world of change. To live with change, to optimize change, you need principles that don't change." I want to take advantage of this limited-time special discount. At the beginning of class in a martial arts school, students may affirm words similar to this: "I am committed to black belt excellence. I am respectful of myself and of others. I am responsible for my actions. I have self-discipline and self-control. My mind and body are now focused, sir!" Underlying these affirmations are principles — including respect, responsibility, self-discipline, commitment, and a positive mental attitude. The students have memorized the principles of martial arts. But they are not necessarily masters of the techniques. No one can tie a black belt around his or her waist and say to himself or herself, "I have arrived!" It doesn't happen that way. The rank of black belt is not something you get. And that is accomplished through dedicated practice. In this program, The 7 Habits Mastery Series, you are going beyond the basic 7 habits techniques — and entering into the realms of a winning spirit for all of life's challenges. You will remain calm. You will know how to solve the challenge and rise above it — every time. That's because the 7 habits will become second nature to you. In the sport of judo, there are three different phases: novice, intermediate, and teacher. This program, The 7 Habits Mastery Series, has a similar approach. In the novice stage, the student learns the terms and techniques of judo. In the novice stage of The 7 Habits Mastery Series, Stephen reviews the 7 habits to familiarize you with them again. In the intermediate phase, the student fine-tunes his or her skills in Judo. The student's knowledge is expanded over a wider range of techniques and understandings. In the intermediate phase of The 7 Habits Mastery Series, Stephen expands your knowledge of the 7 habits — revealing the new framework for solving personal and professional problems in today's ever-changing world. In the teacher phase, the student has reached a black belt in judo. The student has considerable knowledge, ability, and experience. He or she also has a responsibility to be a good role model for everyone. In the teacher phase of The 7 Habits Mastery Series, you will have reached a black belt mastery of life. You will have considerable knowledge, ability, and experience for conquering all of life's day-to-day challenges — and for teaching others what you know. You will also have a responsibility to be a good role model for your spouse, children, grandchildren, co-workers, friends, and boss. How to achieve quantum leaps in effectiveness: Using the P-PC balance to get what you want — and get the desired results you want time and time again. Use this formula to stay healthy, mentally fit, successful in business, wealthy, and fulfilled in your marriage and other relationships. How to build people's trust in you — and keep that trust level high. Discover which kinds of deposits to make in people's "emotional bank account" and which kinds of withdrawals bankrupt people's trust in you. Finding your voice: How to unleash your creativity, resourcefulness, ingenuity, intelligence, and talent! Drive an economic engine so that you make a great living. Help your organization become prosperous. Unleash drive, passion, and productivity in your co-workers! How to develop your highest intelligence associated with four parts of your human nature! The single most powerful communication tool. How the Indian talking stick theory helps to avoid personality clashes and communication breakdowns — in your marriage, with teenagers, and on the job. Four roles of leadership: How to use pathfinding, aligning, empowering, and modeling to lead others successfully — especially in a time of turbulent change. How to predict and create the future you want: Develop the courage to take risks and develop an extraordinary capability to handle major setbacks or disappointments! How to stop wasting time and energy worrying about things you can't control — like the weather, international events, the decisions your spouse makes, what your boss says. Instead, get your desired results (career advancement, love rekindled in marriage, you name it!) using the circle of influence. It helps you recognize the level of influence you have in a situation — so you focus on outcomes you can control. The root reason why families split up and organizations fail — and how to create mission statements (with four important criteria) that put individuals, families, and organizations back on track. It empowers. Builds trust. And provides a continuing sense of guidance in life. The key to win/win relationships in the family and in organizations: How sincere, intent listening and understanding can save you 10, 50, even 100 hours in not having to deal with problems that came from not understanding the first time. You can even heal and revitalize broken and ruptured relationships when you develop these two communication skills. Whether you are a factory worker, CEO, middle manager, janitor, entrepreneur, or single parent — you can become a black belt in life! 9 CDs: A wonderful blend of studio recording and live seminar recordings. One resource CD-ROM: It's packed with great tools such as teaching wizards to help you identify your values and mission, and how to set goals. It also includes a screensaver of more than 200 inspirational quotes. One CD-ROM consisting of four award-winning videos: Watch professionally produced videos capturing the essence of the principles Stephen teaches. An incredibly fun, inspiring, and engaging way to learn! These award-winning films are so good, it's not uncommon for people to pay $400 or $500 for each film. That's a value of $1,600 to $2,000! If you were fortunate enough to attend one of Stephen's seminars, you would have paid $299...$1,295... sometimes more. Yet this program, The 7 Habits Mastery Series, brings Stephen's "in-demand" expertise and ideas to you for a fraction of these costs. I recommend choosing one habit. Practice using it. And what you'll find is this habit is interwoven with the other six. With practice, it gets easier to achieve black belt mastery of these habits. As I mentioned earlier, no one can tie a black belt around his or her waist and say to himself or herself, "I have arrived!" It doesn't happen that way. The rank of black belt is not something you get. It is something you become. When problems arise — you'll remain calm, focused, intuitively knowing which technique is appropriate to handle the situation. So this program is not a quick-fix solution. It requires patience. It takes time to build a solid foundation as a highly effective person. However, with a solid foundation, you will survive and prosper — even in our turbulent world. In martial arts, if you want to achieve a black belt, you find a competent teacher and a good school, begin training, and work hard. In personal development, if you want a black belt, let the wisdom of Stephen R. Covey guide you. He becomes your master teacher. The 7 Habits Mastery Series program is like your school — the place where you learn the techniques for black belt mastery. P.S. In martial arts, once you've achieved the black belt, there's still more to learn. There are 10 black belt levels! As a black belt in personal development — you'll still have much to learn. But the journey is full of compassion, integrity, self-control, courtesy, confidence, respect, honor, social interaction, humbleness, and choosing right over wrong. These are essential qualities in our turbulent world of change! YES, I want to become a black belt of personal development where I excel in honor, integrity, self-control, confidence, performance, and results. 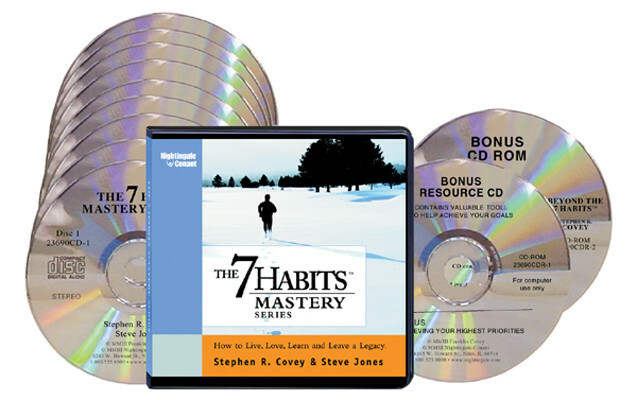 Please send me Dr. Stephen R. Covey’s bestselling 9-CD audio program The 7 Habits Mastery Series: How to Live, Love, Learn and Leave a Legacy plus Workbook on CD and 2 Bonus CD-Roms for ONLY $99.95 — That’s an unprecedented $150 OFF the everyday retail price of $249.95! Take advantage of this limited-time special discount now! If I don’t achieve the goals I want by using The 7 Habits, I can simply return the program in the next 30 days for a full refund. No questions asked.